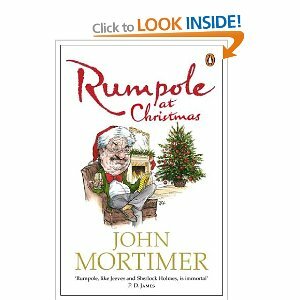 Sir John Mortimer Q.C., the author of the Rumpole stories, died in January 2009. He was 85, a good age, and I had never met him, yet I felt a real sadness at his passing. Why? Well, when he passed away, so too did Horace Rumpole, Old Bailey hack and long-suffering spouse of Hilda, She Who Must Be Obeyed. There would be no more stories of his exploits, his struggles with the likes of Mr Justice “Mad Bull” Bullingham, Mr Justice “Gravestone” Graves or “Soapy” Sam Ballard Q.C. or his attempts to stay one step ahead of Hilda in her never-ending campaign to get him to reduce his intake of Chateau Thames Embankment, fry-ups at the Tastee-Bite café and small, black cigars. One last morsel of Rumpole remains, however. Rumpole at Christmas (or, A Rumpole Christmas in the USA) is a collection of Christmas-themed stories, previously published in magazines and collected into book form for the first time. Amongst the gems are the tales of the fake Father Christmas, the body at the health farm and how he prevents a student from being framed as a murderous religious fanatic, all told with Mortimer’s usual elegance and wit. Rumpole at Christmas should certainly be on the reading list of any lover of Rumpole but is not the best starting place for anyone new to him. And start with him you should, if you don't already know him. Rumpole is one of the great characters of modern English literature, a great eccentric, railing against crooked coppers, prejudiced judges and amoral governments. He is someone with whom you can curl up in a comfy chair, with a glass of something pleasant, and while away a couple of enjoyable hours. Rumpole is, if truth be told, an anachronism. He is an exemplar of a legal London that has long since ceased to exist. He is an old-fashioned advocate, living and working in a slightly old-fashioned way. He still sups a pint of Guinness and takes a wedge of steak and kidney pudding as a working lunch. He has no truck with computers. He litters his speech with literary allusions and quotes from the Oxford Book of English Verse (Quiller-Couch edition, of course). Although the Rumpole stories are humorous, there is a gentle but firm note of morality underlying them. Rumpole never prosecutes (on the one occasion he did, he still ended up defending). Rumpole, to the eternal vexation of Hilda, can never resist poking the Establishment in the eye. Deep down, Rumpole is an old romantic, whose principal aim is to keep his clients out of jail. I’m very fond of Horace Rumpole. I have been reading him for over 25 years now and he was around when I first decided that law might be the thing for me as a teenager. Odd, given that he is a criminal defence barrister and I am a corporate solicitor now, but true nevertheless. I own all of the Rumpole books and frequently pick one out for re-reading. I believe they are a real treat and would whole-heartedly recommend them, especially in holiday season where we maybe want something gentle or even cozy to read. It’s just a pity there will be no more adventures of Rumpole to look forward to. Confession: I’d never heard of Rumpole until now. Sounds fun and… English! Any similarity to P.G. Wodehouse’s style? He is very English - of that there is no doubt! In terms of style, Wodehouse is much lighter and sparkly in his use of language than Mortimer and the Rumpole stories are less absurd in plot than Wodehouse but they are both hugely entertaining and amusing.